Posted by plassaaj on Friday, June 20, 2014 in Neuroimaging. Imaging genetics is an emerging methodological field that combines genetic information with medical imaging-derived metrics to understand how genetic factors impact observable phenotypes. In order for a trait to be a reasonable phenotype in an imaging genetics study, it must be heritable: at least some proportion of its variance must be due to genetic influences. The Sequential Oligogenic Linkage Analysis Routines (SOLAR) imaging genetics software can estimate the heritability of a trait in complex pedigrees. We investigate the ability of SOLAR to accurately estimate heritability and common environmental effects on simulated imaging phenotypes in various family structures. We found that heritability is reliably estimated with small family-based studies of 40 to 80 individuals, though subtle differences remain between the family structures. 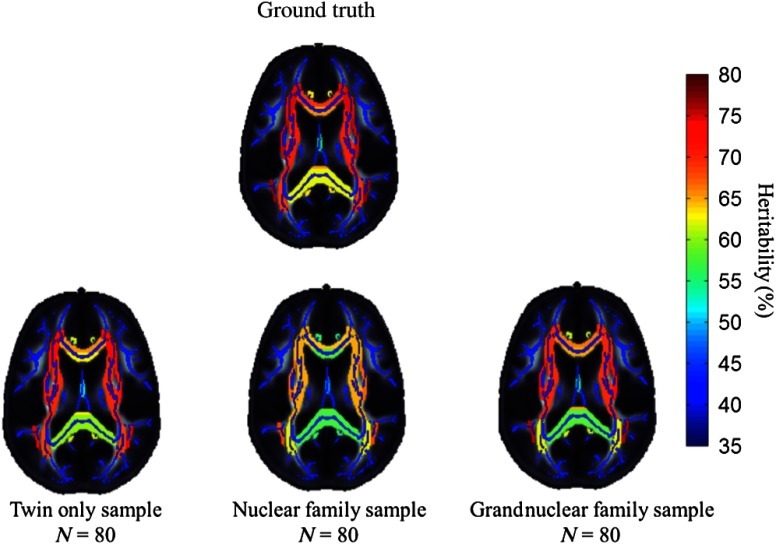 In an imaging application analysis, we found that with 80 subjects in any of the family structures, estimated heritability of white matter fractional anisotropy was biased by <10% for every region of interest. Results from these studies can be used when investigators are evaluating power in planning genetic analyzes. Results from the application analysis. Heritability estimates from the twin, nuclear, and grandnuclear families of 80 subjects overlayed on the ENIGMA-DTI fractional anisotropy template and skeleton. The color scale reflects the heritability estimate, with warmer colors suggesting greater heritability. The ground truth heritabilities were derived from the previous literature.